A puffy, cheery cover framed in soft purple opens onto endpapers depicting a fresh green meadow in early summer. The tone is set for this toddler-friendly book that introduces a few animals and how they feel. On clean, uncluttered, sturdy pages with plenty of white, and using children’s acrylics and colored pencil, Bender depicts in a realistic style—though slightly anthropomorphized—a hedgehog, a toad, a snake, a duckling, a rabbit, a snail, and a kitten. The hedgehog asks the same question of each animal it encounters: “Toad [or Snake, Duckling, etc. 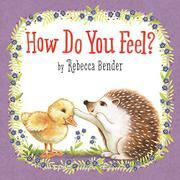 ], how do you feel?” It is in the animals’ vocabulary-rich answers that this book really shines. The toad feels “bumpy, like the trunk of a gnarly tree.” The snake feels “smooth, like a stone polished by the sea.” The snail feels “slimy, like a slippery watermelon seed.” At the end, when all the animals ask hedgehog how it feels, readers will have a little surprise, as its answer is not one of the tactile kind: Hedgehog feels happy!